Catherine Jinn is a company that created pro bio-placenta essence, a serum that mimics all the benefits real placenta has. It is paraben-free, fragrance free, and not tested on animals. It was developed in South Korea, and manufactured in the US. Which is why the name is ,Catherine Jinn, bringing two cultures together to create a product with the best of both. When I was first contacted by their company to see if I was interested in sampling their pro bio-placenta essence, I was a little hesitant due to the word placenta in their product. But after checking out their product and company more in depth, I agreed. This product is made of five safely synthesized growth factors that compare to a real placenta. A growth factor is a substance that is required for the stimulation of growth in living cells. It is biotechnologically engineered to mimic what is found in placenta, but doesn’t actually use real placenta. Why placenta, you might be asking. Aging is caused by loss of growth factors, which are found in placenta. By creating a product that mimics what is found in placenta, it in turn helps reduce signs of aging. 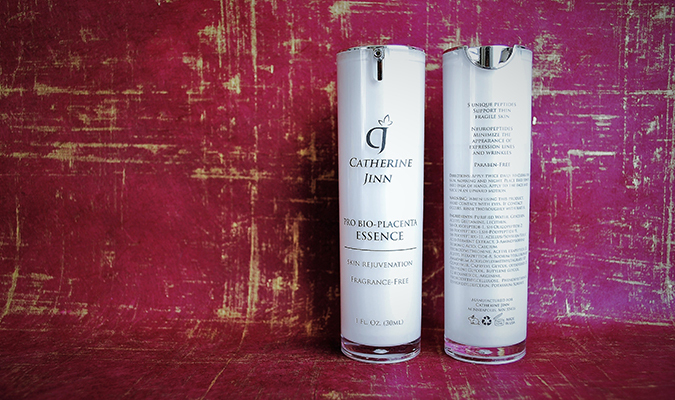 I have been testing out Catherine Jinns’ pro bio-placenta essence serum for a little over a month, and I actually really like this product. Personally, I prefer a serum over a lotion for my face because I feel it is lighter and leaves more of a glow on my face. The serum doesn’t smell, it’s very light and two pumps are enough for your face and neck. It is said to be formulated to rejuvenate the skin, and fight crow’s feet around eyes. I have started noticing crow’s feet showing around my eyes, which have diminished this past month of using the bio-placenta essence serum. They are still there when I squint or smile, but no longer show on my resting face. I also noticed my eyebrows growing in, I started losing some of my eyebrow hairs due to pregnancy. I am not sure if it is related to the bio-placenta, but it did occur around the same time as I have been using it. I noticed no skin dryness, redness, irritation, or breakouts. ( two thumbs up for that 🙂 ) I literally used facial soap and the serum daily and that’s it. I used the serum morning and before bed. Applied on my face and neck in a circular motion, especially focusing on the skin around my eyes. It blends into your skin, doesn’t leave any residue or scent behind. I love that about serum, no oily, shiny skin or heaviness to it. I truly liked this product, and will continue to use it since it has worked out for me. A whole bottle costs $73.97, but it will last you a long time. If you are a busy person, a new mom, or someone who wants a quick cleansing routine, I highly recommend this. The price might seem steep, but considering it’s a big bottle of serum, and the only product you need after washing, it’s worth it. Don’t be scared to splurge on your cleansing routine, especially when it’s on a product that goes directly on your face. Try it out for yourself at CatherineJinn.com or check out their other products. *though I did receive a bottle of pro-bio placenta essence serum free of cost, I was not compensated or told what to say. The company simply asked for a review on my blog sharing how I felt after using the product. I strive on providing honest reviews here, whether I purchased the product or received it for free.